Preparations for the 2014 Tow Car Awards are well under way, and the list of contenders is shaping up nicely. It looks like we'll have the largest field for several years when the tests get started next month to begin our annual search to determine what tow car is the best. This is the eighth year we've run the awards, which is a joint venture between Practical Caravan, The Camping and Caravanning Club, and What Car?, with technical support from the Swift Group. High on the list of contenders for 2014 has to be the new Nissan Qashqai. The new crossover has already been named Car of the Year by our colleagues at What Car?. That means the Nissan starts from a position of strength, as the scores for 'solo driving' and 'buying and owning' are based on What Car? 's road test verdicts. How will the Nissan cope with towing? Well, the 1.6 diesel version we plan to test has a kerbweight of 1494kg (including 75kg for the driver), a legal towing limit of 1800kg and a 100kg noseweight. Those last two figures are unusually high for a mid-sized two-wheel-drive crossover. The engine may be 'only' a 1.6, but it has a healthy 236lb ft of torque. That's similar pulling muscle to many 2.0-litre engines. The Skoda Octavia will be back as last year's overall winner and the defending champion in the lightest weight class. But as well as testing last year's top tow car, I'm also looking forward to driving the 4x4 estate version. Not only does four-wheel drive give obvious benefits for towing in all weathers, it also pushes up the kerbweight to 1455kg. 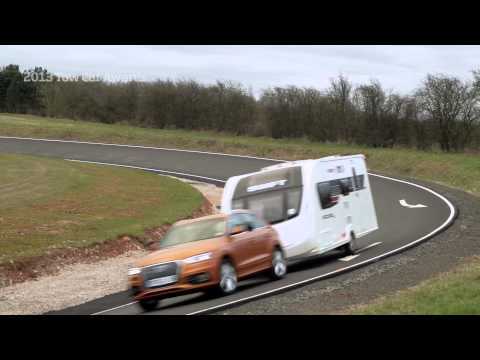 That makes the 4x4 a suitable match for a wider range of tourers, even for inexperienced tow car drivers. Then there's the 610-litre boot, which makes the Octavia Estate one of the most practical cars you can buy for sensible money. You couldn't describe the Range Rover Sport as costing 'sensible money', but if you have the means it has to be a contender for the ultimate money-no-object tow car. I've driven the car solo and been hugely impressed by the performance, handling and comfort. It will be fascinating to see how the £74,995 Range Rover Sport 3.0 SDV6 Autobiography Dynamic matches up to the revised Land Rover Discovery, which even in the top HSE Luxury spec costs over £15,000 less. Either car will be out of reach for most of us, but not every heavyweight in this year's tests comes with a heavyweight price tag. The Ssangyong Rexton W 2.0 EX Auto weighs 2128kg and has a 3000kg towing limit, but even though this is the range-topping version of the Rexton W, it costs £25,995. In other words, you could very nearly buy three Rexton W's for the price of one Range Rover Sport. I know which I'd rather be driving, but I also know which I'd be more likely to afford. As last year, we're also testing some smaller tow cars, pulling a trailer rather than a caravan behind them. I'm particularly looking forward to driving the Fiat Panda 4x4. It's a car which arrived too late for last year's tests and which I've been itching to drive ever since. Those are just a few highlights from this year's tests. I could equally well mention the Citroën C4 Grand Picasso, the Mazda 3, the Mitsubishi L200, the Peugeot 308 or the Suzuki SX4 S-Cross... One thing is for certain, whichever car wins from this strong field will have to be a very good tow car indeed.